Margaretta Todd was, by anyone’s account, an interesting woman. Born into the moneyed Von Hoffman family, as a young woman she turned heads with her red hair and was as well known in Parisian society as in New York. Aggressive and headstrong in her business affairs, she took her son-in-law, William Marchand, as a partner in the Café Francis. When he fell behind on payments to her in 1901, she and her daughter barricaded the restaurant to prevent his entry. She also had the manager, Otto Busse, arrested. Busse later sued Margaretta for $50,000 for false arrest, but the case was tossed out. Margaretta Todd lived in the Von Hoffman Apartments at No. 29 West 26th Street; sometimes called the Von Hoffman Arms. She had begun plans for it in 1893 at a time when the residential neighborhood was seeing the appearance of commercial structures. On April 15, 1893 the Real Estate Record and Builders’ Guide reported that she intended to built a “hotel;” but apparently her plans were not quite complete. Reporting that her architect would be George Keister, the Guide said “Mrs. M. Todd will build a seven or nine-story apartment hotel.” She decided on seven. Completed a year later, Keister’s exceedingly handsome structure melded buff-colored brick and terra cotta to create a Renaissance Revival eye-catcher. The six upper stories sat on a stone base where elaborate carvings embellished the entranceway. Above the doorway’s transom the building’s name, Von Hoffman, was carved. Keister managed to encrust the façade with elaborate decoration—terra cotta bands and panels, three-story Ionic columns, intricate lintels, and bracketed cornices—while retaining a refined appearance. The recessed openings of the sixth floor were separated by paired Corinthian columns. At a time when theatrical types were often shunned, the not-always-conventional Margaretta Todd leased an apartment to the actress Kate Dale. Kate had turned to the stage to support herself after her husband, an iron broker, died in 1895. She died in her apartment here in September 1898. Among Margaretta’s most trusted associates were her maid, Jennie M. Paine (who was apparently as much her friend as servant); her long-time lawyer, Ingersoll Lockwood who enjoyed an apartment rent-free; her doctor, Albert G. Weed; and the Von Hoffman manager, George Amory. They all would become just a few of the players in a scandalous mystery, the seeds of which were planted in 1902. That year Margaretta Todd completed her will. In it she gave her lawyer, Ingersoll Lockwood, proprietorship of the Von Hoffman upon her death. Other friends were to receive cash amounts of around $1,500. Margaretta’s daughter would receive the rest of the significant estate. All parties, including lawyer Lockwood and Jennie Paine, were pleased with the contents of the will. Later that year a bizarre incident occurred while Margaretta was out of town. On December 2 her good friend Anna Haight showed up at the door. Jennie Paine explained that Margaretta was away; but knowing the woman, allowed her to stay. Within a few months after the peculiar incident, Margaretta Todd seems to have begun losing trust in her attorney. In 1903 she rewrote her will, naming her daughter, Mrs. Frank Tousey executrix, instead of Lockwood. And she hinted that there could be yet a third will forthcoming. According to people close to Margaretta, Lockwood began laying plans to regain his grip on her fortune. In May 1905, after Margaretta’s daughter sailed for Paris, Jennie Paine began suggesting to Dr. Weed that her mistress had gone insane. In May, Margaretta told George Armory that her 1903 will had been stolen from her rooms. She seems to have suspected Ingersoll Lockwood. On Thursday night, October 26, 1905, Margaretta informed her new lawyer, George Gordon Hastings, that she written her new will. The two made arrangements to meet the following day to sign it. That morning, according to J. P. Carter in his 1911 book In the Cave of Aladdin, she “declared prophetically, ‘I often compare myself to Mr. Rice, and fear I shall meet his fate!” The “Rice” she referred to was millionaire William March Rice, murdered in 1902 to access his estate through a forged will. There would never be a new will. The New York Times reported that later that day “Mrs. Todd, wearing valuable jewelry, a wig, and a striking gown, left the Von Hoffman to visit some town in New Jersey.” Margaretta Todd would never return. 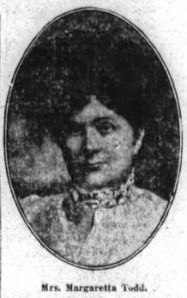 Within a few hours Margaretta Todd’s mutilated body was found on the railroad tracks near Philadelphia by a Philadelphia & Reading railroad flagman. Her head was crushed and both legs were severed below the knees. According to The Evening World she still wore $20,000 worth of diamonds. It was just the beginning of several years of a court battle and murder mystery that would rivet the nation. Within hours of her death, Ingersoll Lockwood filed the 1902 will and insisted that George Amory give him the key to Margaretta’s apartment. He did not gain access to her rooms; but he retook his old apartment and hired a force of private detectives to enforce his control of the Von Hoffman. When Margaretta’s daughter returned to New York, she barricaded herself in her mother’s apartment, hired her own team of detectives and forced Lockwood out. The long court battle over the missing will, the estate, and who killed Margaretta Todd was covered by newspapers nationwide. One of the deceased was Margaretta’s daughter, Rosalie Tousey Hastings. In yet another odd twist, she had married her mother’s new attorney. On December 30, 1906 The Sun reported that she had died in Nice. The Von Hoffman passed to George Gordon Hastings. Margaretta’s murder, incidentally, would never be solved. By 1918 real estate dealer Joseph Ajello lived here. The 55-year old suffered from vertigo and when his housekeeper, Jennie Jackson, arrived on August 23, she could not get into the apartment. She summoned a police officer who forced the door. Ajello was found dead slumped over the gas range; asphyxiated from illuminating gas. “In his hand was a hot water bottle that he had evidently been attempting to fill when he was overcome,” said The Sun. Meanwhile, the retail space at street level was home to the fur shop of Pines & Co. Around 9:00 on the morning of November 25 three armed men entered the store and ordered 23-year old Roma Pines to put up his hands. Instead of complying, he gave out a yell and leaped at one of the gunmen. It was not a good idea. The hold-up man fired two bullets into the clerk’s abdomen and one into his right thigh. “As he fell his assailants beat him over the head with their revolver butts, stepped over his body and ran out each with an armful of seal and fox skins,” reported the New-York Tribune. The robbers threw the several thousand dollars worth of furs into a get-away car and fled. Pines was taken to Bellevue Hospital in critical condition. On October 4, 1919 the Real Estate Record & Builders’ Guide reported that Hastings had commissioned architect John H. Scheier to convert the Von Hoffman into lofts and offices. The conversion, somewhat unexpectedly, did not alter the façade in the least. By now the building was firmly engulfed by the Garment District and in 1920, when it reopened, the tenant list was almost exclusively apparel-related firms. Pines & Co. renewed its lease and in January Goldstein & Wallace moved in, as did Joseph Bros. A month later Hellman& Wharton; Hyman Davis; and Tessler & Scheier signed leases. In April fur manufacturers Hecht & Smith took half of the fifth floor and a few weeks later Weinberg Brothers leased the third floor. The same year Sherman & Portugal, another fur dealer, moved in. The entrance, other than replacement doors, is surprisingly intact. Throughout the 20th century the building continued to house apparel and other light manufacturing firms. The retail space has been altered and replacement doors and windows, as would be expected, have been installed. Yet overall Margaretta Todd’s imperious Von Hoffman is astoundingly intact; the scene of one of the nation’s most shocking mysteries. My word, the true stories associated with the Von-Hoffmann building history would make a terrific episode on PBS Mystery! The façade decoration on this building is wonderful.